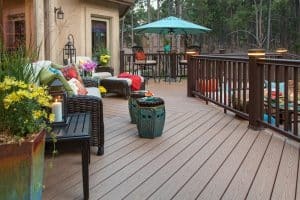 If you’re dreaming about a deck for your backyard, then you really need to consider composite decking—it offers all the natural-looking beauty of timber with a few extra benefits. Composite decking is made from recycled plastic products and wood grain, making it an eco-friendly choice. The product is coloured during the manufacturing process meaning it won’t require any painting or staining for decades. The addition of plastic to the wood fibre means that planks used to construct your deck are both mildew and insect resistant, are less prone to rot and easier and faster to install due to the uniformity of the plank sizes. Composite decking is a lower maintenance product as compared to a natural wood decking. You will never have to replace rotten boards and you wont have to spend a weekend staining the decking once a year. Plus, the decking boards come in a range of colours and sizes making them perfect for any project or application, whether it is a large deck, a small porch or an attractive surrounding for your pool. The versatility and durability of this product, combined with Everlast’s famous workmanship makes a deck laid by Everlast the perfect choice for your backyard beautification project. Why Choose Everlast for Your Composite Decking? Composite decking is a great choice for anyone wanting a make a difference in the environment and going with Everlast Services is a great choice for anyone wanting to give back to the local economy. We are 100% Australian owned and operated and try to use local products wherever possible. You can’t beat the affordability and quality that Everlast Services provides. We truly believe in providing the best possible products at affordable prices so don’t delay your decking project anymore because you’re worried about the budget, get in touch with us and we’ll sort something out for you. Experience is everything when it comes to landscaping. We’ve created decking solutions for all types of spaces and we know how to turn your backyard into a space to enjoy. If you’re looking for more than just a deck you’ve come to the right place. We provide a whole range of landscaping services from paving, to garden beds, vegetable gardens and green walls. No matter how big or small your project is we have the tools to make it happen.